H.M.S. 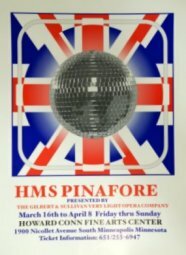 Pinafore opened in London in 1878, and became the first great success by Gilbert and Sullivan. We chose to set our production one hundred years later, in 1978, on a British cruise liner bound for the imaginary tropical island of Barataria.